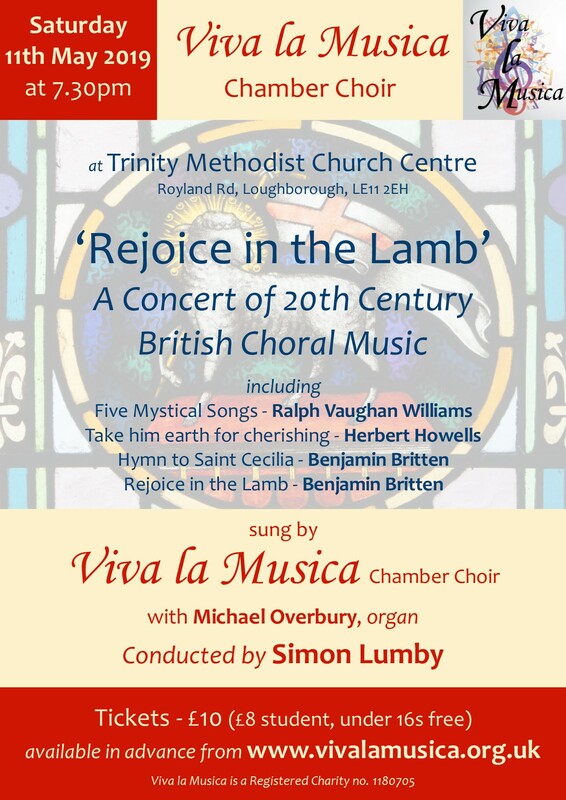 Loughborough Chamber choir, Viva la Musica, present an evening of twentieth century British choral music at Trinity Methodist Church Centre, Royland Road, Loughborough LE11 2EH. The programme will include: Five Mystical Songs (Ralph Vaughan Williams), Take him earth for cherishing (Herbert Howells), Hymn to St Cecilia (Benjamin Britten) and Rejoice in the Lamb (Benjamin Britten). Tickets are £10 (£8 students, under 16s free) in advance from www.vivalamusica.org.uk or on the door on the night.